We’re the best source for Denver real estate investors to Partner on finding, funding and flipping great discount and investment property in the Denver, Colorado area. We’re constantly picking up new properties to partner up with and always have properties available. You may have even seen some of our marketing around Colorado or other States in the Region. If you’re a real estate investor and are looking for great rental properties that will cash flow or distressed properties to rehab and resell… have us find and partner on those properties with you. Just tell us what your buying criteria is, and we’ll custom search for properties for you that fit your criteria. 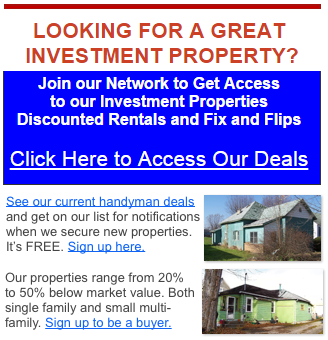 Most of the properties we acquire are bought up by real estate investors looking to flip or rent. However, if you are looking for a home to live in yourself… you’re at the right place! Join our Preferred Partner list and act fast if you see a home you like. Because we offer these great houses at such steep discounts they do tend to sell fast… so make sure you’re pre-qualified with your bank (we can help you with that if you’d like) before you make an offer on one of our houses.